The program of this gallery is failed art. How can we think about this? What is failed art? Apparently it’s the artist who decides that what he or she attempted to do ended in failure. But that can’t be, because the artist then submits the work to the gallery. Doesn’t that mean the work is an interesting failure? Sorry, that’s an oxymoron. If it’s interesting, it can’t be called a failure. Maybe the artist doesn’t find it interesting, but depressing. Then the gallery would be offering therapy by accepting the work. This gallery would have to be swamped with inquiries. How does the curator decide which failed work will get shown because it’s the best failure? Best failure? Worst failure? When an artist’s failed work is chosen, does the artist then consider herself a success? At the opening, do the guests congratulate her? Will this go on her résumé? 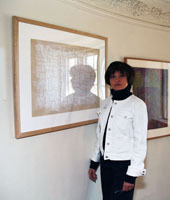 On the gallery’s web site, http://www.tmr.la/, the word “mistake” is crossed out. Ah, so that’s it. There’s no such thing as a mistake. Or is the word “mistake” crossed out by mistake? An installation view of “Oscar Murillo: Distribution Center,” 2014, at the Mistake Room.